WHAT: A best-selling author and current Nieman Fellow at Harvard University, Geary is also an aphorism expert. His new book, “I Is an Other: The Secret Life of Metaphor and How It Shapes the Way We See the World,’’ is a colorful history of how sayings like “The early bird gets the worm’’ influence our lives and choices. 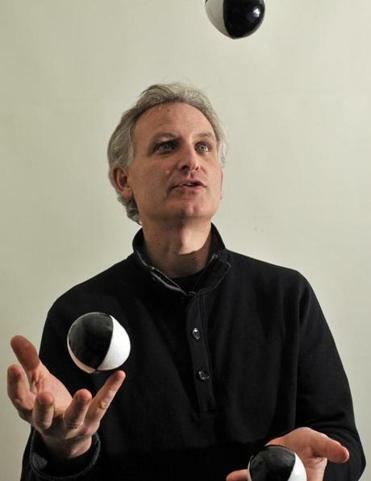 He’ll talk about the book - and juggle, too - Thursday at 7 p.m. at the Harvard Book Store, 1256 Massachusetts Ave., Cambridge. Q. While I tell you with a straight face that I totally get what aphorisms are, please explain for our readers who may not get it. A. It’s kind of a multisyllabic word for something very simple: a short, witty saying. People think of aphorisms as highfalutin, but they’re the oldest texts on the planet. The first form of aphorisms were from one Egyptian ruler passing down to his son how to be a good ruler, and a moral ruler - 5,000 years ago. Q. How do we apply aphorisms these days? A. We use them every day. They’re in pop songs and on billboards, things your grandmother used to say, like “A penny saved is a penny earned.’’ Aphorisms are the only form of oral literature still practiced everywhere. Here’s an example: My son is 17, and a year or so ago had his first breakup, the end of his first love. Instinctively, I said to him, “There are plenty of fish in the sea,’’ and I told him, “Don’t sweat it!’’ Those are common uses. Q. How did you become enamored of aphorisms? A. My parents got me a subscription to Reader’s Digest as a child, and the “Quotable Quotes’’ section was full of them. I’ve loved aphorisms ever since. I still remember the first one I read in “Quotable Quotes.’’ It was “The difference between a rut and a grave is the depth.’’ At 8 years old, I had no idea what that meant, but I knew it was special. Q. Are you the life of the dinner party, or do you annoy people with your ability to dissect their isms? A. Well, the subject of aphorisms does come up at dinner parties and usually goes over well. I’m not the kind of person who hears something and says, “Ooh! That’s an aphorism, and there’s an aphorism for everything!’’ I mean, there is an aphorism for everything, and in my show there’s a point where I challenge the audience to give me a theme, any theme, and if I can’t come up with an aphorism for it they get a free copy of the book. But at a dinner party or that sort of setting, I’d never press people on them or spout them off. I don’t want to be that guy, the guy who comes off as preachy. Q. In your show, during which you discuss aphorisms and language, you juggle, too. What’s the point? A. It’s just a gimmick! No, it’s not. I’m kidding. It would spoil the show if I told you the link between juggling and aphorisms. But I can tell you I use juggling as a metaphor for the five laws of aphorism, because juggling forces you to stay sharp. Reading aphorisms keeps you on your toes. Aphorisms are confrontational and make you think. Q. Were you formally trained to juggle, or did you just start tossing things in the air one day? A. I wasn’t formally trained, but I used to live in Amsterdam, and a friend had a consulting business there. He’d give lessons to corporate executives, and they’d use the skill during these offsite meetings for a day or two, as part of some motivating demonstration. He taught me. Q. Are there new aphorisms being made today? A. You would not believe the amount of new ones being written today. I publish them from all over the world. The Finnish people are incredibly astute at it. The Balkans are quite good. Q. Speaking of short, choppy writing, what do you think of Twitter? A. Aphorisms have been around since the beginning of writing, of literature. Now, given Twitter and the emphasis on being fast and brief, there’s a convergence happening, where this age-old form is kind of getting matched up with the culture and technology.